The snow came early in 1949. It seems a miracle that my father, then just a boy, would be allowed to ride 17 miles, through a blizzard, so that he and my abuelito might rescue the herd. There is no magic to the way sheep die in a blizzard. It is not from the cold. They huddle together for warmth, their bodies like pills in a bottle, and the snow falls and the sheep do not move. They suffocate beneath a slow avalanche of accumulated snow. Even when the snow is at their eyes, the sheep remain motionless as windows, witness to their own demise but patient, a primal faith that their shepherd will save them. Even at 12 years old, you take note of death around you. 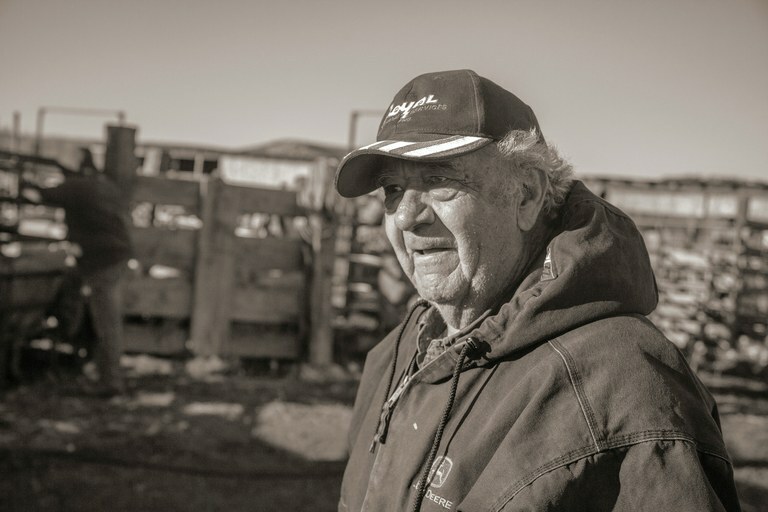 If you live on a ranch for any period of time, you will learn the ways things die; a calf dies near a pile of concrete at a fence line in the middle of a June prairie, bitten by a rattlesnake. As a grown man, you will still hear the mama cow cry into a bright, cloudless day — loss’ eternal echo. You will inherit a racehorse named Master Bars from a family friend and marvel at the animal’s height and elegance, but you will struggle to understand why, come winter, despite the snow everywhere, the animal refuses to eat the same hay as the other animals. The most beautiful animal we’d ever seen died on a January night. He was not beautiful in death, a frozen emaciated corpse, 18 touchable ribs arching into the January day. The lambs abandoned or sat upon by their mothers will be placed in a collective memory. The lambs that survive jump and play in the March mornings to heal those watching. You will remember all the calves born into snow banks, their bodies frozen within minutes, so motionless you might swear they were made of wood or of ice. There will be Suffolk rams bloated and green at the edge of alfalfa fields; a saddle horse mistaken for a bear; a semi tractor-trailer that didn’t slow down as the herd of sheep crossed the road to water; a vandalized stock tank releasing 35,000 gallons, turning the earth around the trough to a mud so deep and thick that seven cows and one calf would die there — their still-living eyes being eaten by crows. You will remember how your father fell to his knees in the very same mud and gave the calf CPR, and you will feel shame for feeling relief when he finally gives up. In the regular world, it wouldn’t make sense to send a 12-year-old, on horseback, into a blizzard, for a 17-mile ride to the high country, but to all of us who know death so well, it does. It is our job — thankless and necessary — to keep death at bay. This is why my father and his father saddled up in the 4 a.m. dark of a late September, the moon a vapid pearl behind the storm clouds, and they rode off toward the west, toward a herd of sheep that would all suffocate to death if they did not do so. My bisabuelo abandoned a wife and four children. The oldest boy — an 8-year-old — was my abuelito, Amos. He tells of how cold the house was. He recounts the trains that passed on their journey north, bellies of coal brimming black as burnt-out suns, the trucks of the gondolas rocking along the standard-gauge line, the slow and heavy clatter of a passing train, a noise receding in a drawn-out minor key. There, the boy hunted for fallen coal in the gray ballast that was the track bed. I imagine how each piece of found coal was equal parts joy and resentment. The older man I knew would not have come home until the bag was full. That black bituminous load upon his shoulder was a burden that even time did not lift. My grandfather was made of stone, and my awe of him was only tempered by a greater fear. There is some speculation that, perhaps, I have inherited his shoulders. My great-grandfather was named Serafin — a name treated as sin. Fragments of words and stories of him have fallen to the floor and been collected in a dustpan of partial stories, memories and impossible clues that were set to flame by anger. He abandoned his family so completely that my grandfather, whose middle name was Serafin, chose an absolute deletion of his father as vengeance. 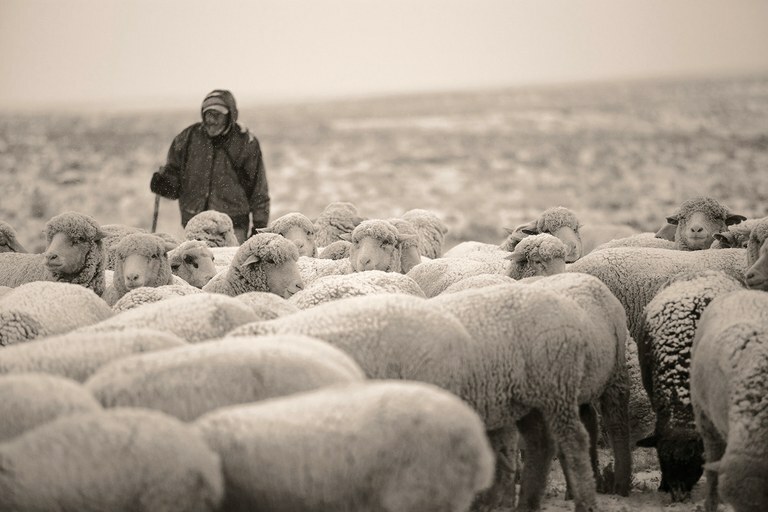 Victor “Cuba” Hernandez tends Abeyta family sheep in snow squall on the Taos Plateau, en route back to Mogote, Colorado. 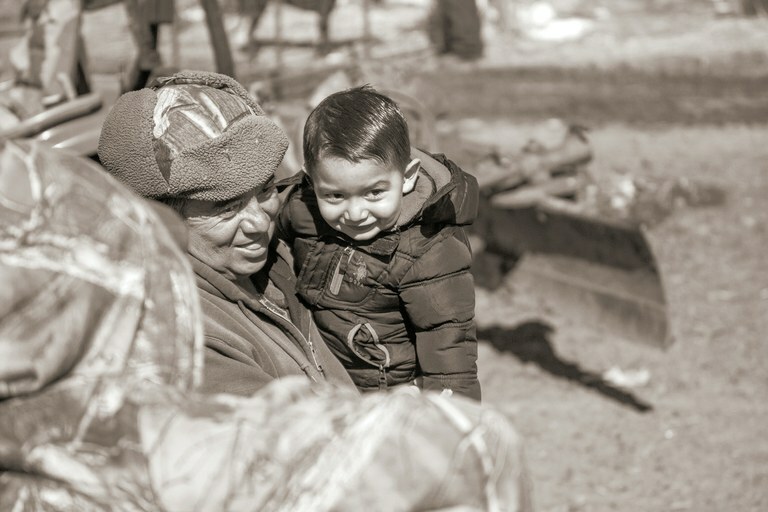 Andrew Abeyta and grandson Adrick during shearing in 2015. 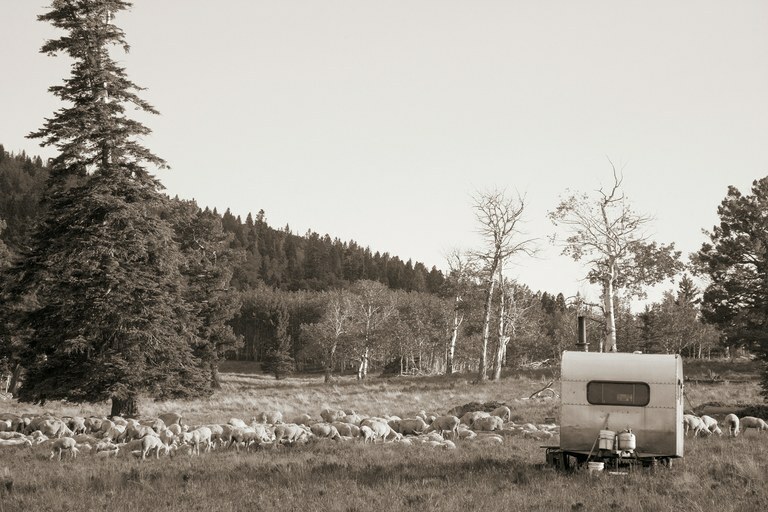 Victor “Cuba” Hernandez’s summer trailer in the mountains of the Cruces Basin Wilderness, where he tends Abeyta family sheep. 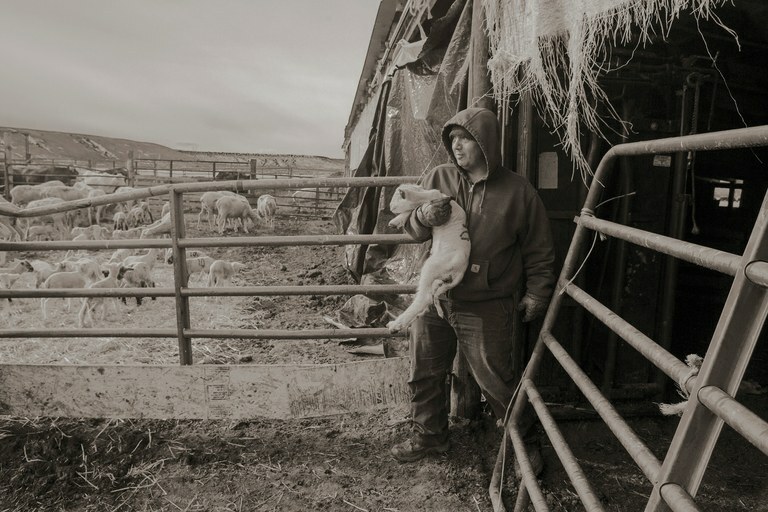 Andrew Abeyta, son of Alfonzo, holds an orphan lamb after a 2015 snow storm that left 26 ewes dead. When the snow began that September, the herd was near Rivera’s, a place the herders would go for wine, whiskey, and stories of bears, coyotes and hand-caught brook trout. Sometime after sun-up, my abuelito and my father reached the Los Pinos River, 11 miles from home. From there, the horses would have to climb six miles to the northern end of a great meadow, where the sheep were trapped by still-falling snow. The herder, Fidelito, knew the snow was racing the flock he was paid to tend. He saddled the animals and packed the camp in a rush, covering nothing. He pushed across the meadow, moving north toward a crest of great pink-and-green rocks and a small stand of aspen — the only windbreak. The herd would not travel any further. He worked the herd between two house-size rocks and let them rest among the aspen where the snow wasn’t as deep, to wait for the snow to stop or help to arrive. Sheepherders have an undefinable profound faith; they trust that even in the darkest moment that deliverance will find them. Two feet of snow had fallen, the sky still winter chalk, but Fidelito knew that my grandfather had already crossed the black ribbon of Los Pinos River water and that the horse would carry him to this promontory at the edge of a great meadow in the center of a greater wilderness in the midst of an even greater storm, and that somehow they would prevail. Before he took the title from Jess Willard in 1919, Jack Dempsey was known as Kid Blackie. He’d make his money fighting in saloons, in makeshift rings or on warehouse platforms. The legend known as the Manassa Mauler was born just a few miles from my hometown. Even before he was champion of the world, people knew he was not to be quarreled with. To fight him was a stupidity reserved for unfortunates unaware of Dempsey or his reputation. Locals knew to steer clear of his taunts and bravado — bait to separate men from their paychecks. Sometime after my abuelito passed away, I received a call from a distant relative who was working on a family tree. He’d come to the portion of the tree that forced forgetting had carved out: my grandpa Amos. I told him that my grandpa was a five-term sheriff of Conejos County, who’d been shot twice by a man made mad by brujas — the first shot grazing the center of my abuelito’s skull just above the bridge of his nose; the second entering below the sternum, following the curve of a rib and exiting at the spine. I told him how, afterward, my abuelito’s right leg was never right, how I tended to stare at the jagged, pale, soft pink flowered scar in the middle of his back as he shaved over a kitchen sink overlooking the ranch he’d built from hard work, anger and resentment. I said he was the toughest man I have and will ever know. Not surprised, the man asked if I knew how the rest of the family thought my great-grandfather a hero of sorts. He recounted stories his father had told to him; the admiration in his voice was audible. He told me of the time my bisabuelo fought Dempsey in a potato cellar one late August day in the voice of someone who’d been there. Saw him fight once. That’s why that man hired him, because he was stronger than hell. It sure was hot that day, humid too. End of August and all the people down at the cellar had just been paid. Big thick clouds were over the mountains. Far-off lightning and thunder like it was coming toward the end of the world. I suppose it was right around evening. Most of those men had been loading hundred-pound sacks of potatoes all day, the loading docks were stacked with them, like a fortress of burlap, roots and dark earth. Stanley Barr said he was worth two men, the way he could work. Your great-grandpa was younger then, stronger too. He paused, the phone was humming slightly. There was a great distance in that silence. I remembered it from my youth and knew it to be inherited and then taught. Then he resumed. Everyone knew Jack before he was world champ. He’d left Manassa a few years before, but he’d come around every now and then. He was like us, poor as worn-out shoes. He made his money in the bars and potato cellars. We all knew that’s why he was there that evening. He said he couldn’t sing or nothing like that, but he’d knock the tar out of any man who put up a few dollars. Jack was meaner than hell. He punched like a mule kicks. No one was stupid enough to take him up on his offer. We’d all seen what he could do. Everyone just laughed and shook their heads. No fool would fight Jack. That sort of stupidity was reserved for miners and prospectors. Jack went on for a few minutes and most of the men had stopped working. Your great-grandpa was stacking hundred-pound sacks near the top of the cellar; he had no patience for men who didn’t know how to work. Everyone was just standing around taking a break as Jack was talking away the last of the light. It went silent as a funeral after your great-grandpa finally spoke up, something along the lines of you talk too damn much. Shut the hell up so we can get to work. He wasn’t a miner or a prospector and he knew Dempsey. I guess his cup just filled up. Jack would’ve fought him for free, he was so mad. Your great-grandpa came down from up top, a few dim bulbs, a setting sun and some far-off lightning were all we had to see by. He was dark with the dirt of potato fields with boots so beat down the heel was nearly gone. He must’ve been 20 pounds lighter than Jack. I never saw Dempsey fight Tunney or Willard, but I saw him fight your great-grandpa. Jack walked across that platform like a storm and Serafin just stood there, his dirty hands balled up at his waist like he was too tired to lift them. I’ll never forget the way Jack shook his head after your great-grandpa hit him the first time, like maybe he knew maybe it wasn’t going to be so easy. Alfonzo Abeyta, son of Amos, during shearing. My father remembers this, perhaps above all things about those two days and the 65 years since. His father laid him down beneath a spruce, covered him with a canvas tarp stuffed with duff and spruce needles and surrounded him with three saddles to break the wind. Then he walked into the onyx night, into the wind that replaced the snow, and dug through the night to save the herd. My father doesn’t mention sleep, nor being cold, in his retelling of the story. He has sincere admiration — perhaps older than written words — in his voice. Perhaps those two needed that wilderness. I cannot remember them getting along, not really. My father could never please my grandpa. I remember disliking the way he treated my dad. But I loved my abuelito. He was what we all wanted to become. What drew my great-grandfather down from those potato sacks? Did he really fight Jack Dempsey until both men were too tired to continue? Did he abandon his family? Or is another story truer — that he’d had an affair with his boss’ wife, who then framed him for stealing? Was his leaving a story they told the children to protect them from knowing he was sent to jail? Can you spend your entire life forgetting the man who is your blessing and your curse? Which is the greatest foe: the future heavyweight champion of the world; the arduous task of purposely forgetting; the blizzard that could have buried an entire herd alive; the blood of a father traced in the fists of his son; a wilderness of great meadows, house-sized rocks, wind and spruce; a 17-mile ride through a blizzard; shoveling for 12 hours straight; walking the empty sides of train tracks looking for coal; knowing that your oldest son wishes to never speak with you again; accepting a lie as truth; murdering away reconciliation; the daily task of never being satisfied? How do we come to know the thing that is most like us? I wonder if similar questions arise in places without mountains, rivers and trees made of shadow and silence. Surely, this is the work of the stormy and fierce heart of every human. Dawn broke, the wind finally stopped, and faith was rewarded. My father rose from his bed of spruce needles to the sound of axe against timber, the constant thump of it as two small trees were felled. The trees were tied to my grandfather’s horse. Only the heads of the sheep were visible, but he rode the horse around the herd several times, clearing a path with the wake of the trees. Then he pointed the horse north, downhill, toward the river and home. Fidelito and my father urged and pushed a sheep onto the broken path. One by one, the sheep broke free and walked after their savior toward lower ground. By noon they’d crossed the river. By nightfall they’d all reached home, alive. All of my grandfathers are gone now. On occasion I drive the road up from the river, and I recall the camps, the good meals, the horses that went missing, the several herders, the animals we lost. Eventually, you reach a place where the road ends and there is a snow- and wind-battered sign that reads “Wilderness. Closed to motorized vehicles and motorized equipment.” It is known as the Toltec Unit, a cruel place with little water and a loneliness difficult to comprehend. So many stories begin for me there. The men in my life are always associated with places — both wild and on the side of a well-traveled highway — and stories. I will never know my great-grandfather. I know the story where he is a hero and another where he leaves. The stories of my abuelito and my father are more numerous and more complimentary. There is a grace in knowing I understand them. I reach the rocks and aspen trees where the herd was nearly buried. The natural world is intact, as it’s been for centuries. The human side has faded in the proper order of things. The place is made sacred by my memories, strength and the brief kindnesses displayed there so long ago. There are names carved upon the trees, but there is no need to read them; I know all they have to say. Excerpted from Wildness: Relations of People and Place, coming April 2017 from University of Chicago Press. Edited by Gavin Van Horn and John Hausdoerrfer. Aaron A. Abeyta is the author of five books and recipient of the American Book and Colorado Book awards. Abeyta is a professor of English at Adams State University, and he makes his home in Antonito, Colorado, where he also serves as mayor.